We expanded our guide and re-arranged our list accordingly. If you’re looking for new ways to add extra color to your tone, Chorus pedals are your way to go, providing wonderful lush sound enrichment while adding barely perceptible thickness and interference in your sound. Chorus is used in some of your favorite rock ballads dating back from the 80’s, a fact which you may not even be aware of. How To Use A Chorus Pedal? What Applications Are Most Suitable For Chorus Effect? It’s definitely a must have effect for every avid guitarist out there, regardless if you’re thinking about expanding your collection or grabbing your first-ever pedal, you can’t go wrong here. Enjoy this carefully prepared list and take your pick from some of the best pedals ever produced. When it comes to setting standards, M234 is pretty much up there. One of the rare pedals that offers at true touring worthy experience. Performance on a pretty decent level that won't break your bank account. One of the popular models which offers great value for the money. Compact and capable, this pedal brings lots of range for the price. More advanced model with lots of control and great I/O options. Innovative features and a rich control interface is what this pedal offers. One of the familiar and favorite go-to models that still performs great. M83 brings a somewhat advanced design that is backed with great performance. A more aggressive pedal with a wide range of chorus options. A lot of guitar players tend to associate MXR with simple pedals and clean controls. This is true in most cases, but MXR M234 is there to break this pattern. Aside from being atypical for MXR. M234 just happens to be one of the great analog pedals you can find on the market today. It brings that trademark analog feel to your tone, and its extensive controls allow you to dial in chorus effect exactly like you want it to be. What really sets it aside is its performance. The general vibe of the effect is impressive. You get that glassy chorus effect which really saturates the section you are trying to enhance in an organic way. Nothing sounds artificial about this pedal, and that is one of the main reasons why people love it so much.On top of all that, the price is right in the sweet spot. It’s neither too expensive nor is it outside of the realm of budget users but rather on its edge. 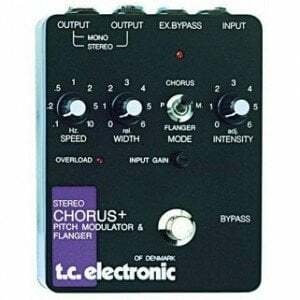 Chorus is the type of effect that is right up TC Electronic’s alley. Their Corona Mini stands out as one of the most versatile and most user-friendly designs on the market. The enclosure the gizmo comes in is of the slim variety, with only three control knobs available. However, adjusting the speed, depth, and FX level is definitely not the full extent of its capabilities. 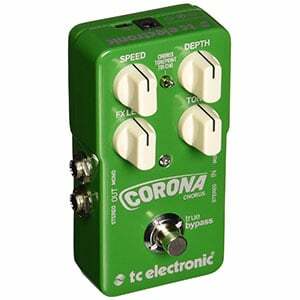 Just like so many other TC Electronic pedals before it, Corona Mini comes with Tone Print support. This feature allows you to design your own chorus effect using a proprietary piece of software, and upload that preset onto the pedal. In other words, if you don’t like the factory chorus that comes with the pedal, you have free reign over what your Corona Mini is going to sound like. There aren’t many other models out there which offer that type of experience, and definitely not in this price range. If you are looking for extreme versatility, this pedal is an obvious choice. Fender is not usually the name you associate with effects pedals, but they sure have their moments. Their stompbox we are looking at here is among the easiest and most neutral affordable ones of this type which you can find at the moment. The effect this bad boy offers is full of warmth and range while it gives you that organic feeling. When applied to a clean channel or an acoustic guitar, it does wonders. However, that doesn’t mean it can’t boost your distorted tone as well. On the contrary, if you need to give your riffs a bit of width, Fender Chorus guitar effects pedal will get the job done while preserving clarity at all times. This is something that not many choruses in this price range can say for themselves. Those who need a good, versatile solution on a budget should definitely look into this Fender box. It might be exactly what you were looking for all along, and probably even more than that. Small Clone is one of the most interesting pedals of its type. Electro-Harmonix did their magic once again, giving us a chance to experience a versatile chorus that is capable of delivering a wide variety of options. The enclosure is more or less standard Electro-Harmonix business, with its wide body and very meticulous graphic design. Once you plug it in and look at the available controls, you might be tricked into thinking that you are limited in terms of tone shaping. That couldn’t be farther from the truth. Small Clone allows you to dial in anything from that standard lush chorus, a solid 12 string effect, to a pretty rad Leslie type chorus. That is a pretty great range of options in a pedal that is fairly reasonably priced. This thing works great with electric guitars as well as acoustics or bass guitars. Whether you’re looking for a simple solution or something a bit more flexible, Electro-Harmonix Small Clone will most likely be a perfect fit. When it comes to simple but effective pedals, MXR definitely knows how to get the job done. Their M148 Micro is a tiny box that packs a mean punch. The pedal comes in their standard slim format, while it features only one control knob that lets you adjust the depth of the effect. Some might say that’s not enough, but you have to try this thing before you start reaching conclusions. This is an analog chorus on a very high level. Sure, you can’t really shape its tone all too much, but the one it offers right out of the box is impressive, to say the least. The effect is warm, like only an analog one can be. It delivers a very organic, natural sounding experience at a price that is more than reasonable. MXR M148 is old school, so those who are looking for a vintage type of chorus will find a quality match in this pedal. At this price, it’s a pedal worth looking into. SCF World Standard by TC Electronic takes the chorus game to a whole different level of versatility. First and foremost, this is a multi-purpose effects pedal. If you look at the controls, you will see a small switch that allows you to toggle between chorus and flanger effects. Aside from that, you get a number of outstanding and practical features if you decide to give SCF World Standard a shot. The pedal comes with a true bypass, standard input, but just two outputs. One is mono and the other is stereo. There is also an input gain knob which allows controlling the gain. Standard tone shaping controls come in form of the all familiar speed, width, and intensity knobs. The type of chorus you can dial in with these controls is among the more versatile ones. This versatility explains why this pedal is popular among guitar players as well as keyboard players. While it is anything but affordable, SCF World Standard brings the performance worthy of its name. Here’s another MXR design which you simply have to include on any list worth its salt. MXR Stereo chorus delivers the type of quality you would expect from a top tier pedal like this one, but it also packs a whole lot more. The enclosure the device comes in is wide, definitely wider than most MXR designs out there. This pedal features your standard rate, intensity and width controls, but interestingly enough, it also offers a two-band EQ. Using this EQ, you can shape the tone of the chorus and thus create more or less contrast between your raw signal and the effect itself. Another great feature is the addition of a stereo output. Combined, everything MXR Stereo brings to the table makes for a pretty versatile package. Whether you are looking for a great chorus effect to add some flavor to your tone, or a professional grade tool to use for on-stage work, MXR Stereo should be on your list. Boss has is known for one thing more than anything else, and that is designing no-nonsense effects pedals which simply work. Boss CH-1 brings those qualities into the chorus segment of the market. 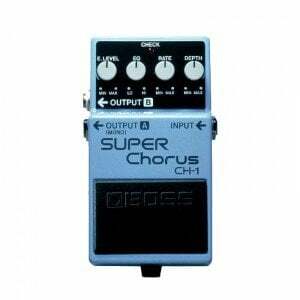 Featuring that same proven Boss enclosure, CH-1 is pretty much average in most of what it does. The controls are standard, with the addition of effect level, and you get a stereo output as well. The tone itself is what puts this thing on the map. Boss designed a natural sounding, lush chorus that brings a dose of clarity into the game. This pedal can take just about any kind of signal and do its magic on it. Whether you are on a clean channel, or a distorted one, you will get the performance you need. Thanks to its versatility, Boss CH-1 can be used with acoustic guitars as well as bass guitars with a great deal of success. 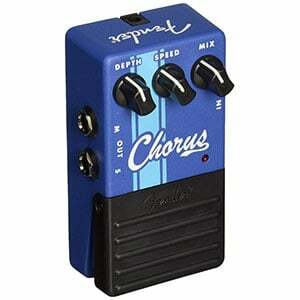 Compared to other stompboxes in its category, CH-1 is fairly reasonably priced, and offers more in certain aspects. M83 is fairly similar to the MXR Stereo chorus pedal, with a few exceptions. Unlike the Stereo Chorus, M83 MXR Bass Deluxe comes in a standard enclosure, making it easier to fit on pedalboards. In terms of controls and features, you get a lot. First thing first, there are your standard intensity, rate and width controls. Aside from those, you also get a great two-band EQ that really impacts the way your effect comes out the other end. Next thing is the Flanger option, which makes this a 2-in-1 pedal, and something Dunlop calls X-Over mode. Once you punch that button, your bass frequencies are dialed back a little, allowing the trebles to punch through with more clarity. The amount of chorus types you can get from this pedal alone is pretty impressive. Needless to say, this puppy has a lot of range. In terms of price, it’s not something you would consider affordable. However, with M83, you definitely get what you pay for and then some. 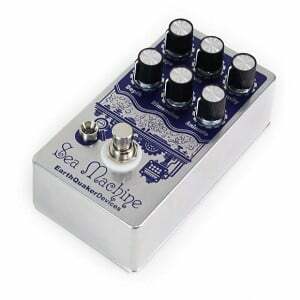 The Sea Machine V2 is one of the most functional and resourceful chorus pedals on the market. Providing you with an extensive multitude of options, digital and analog circuits, all fit together in an attractive and effective “stomp-box”. Rate, Shape, Dimension, Intensity, Animate and Depth is what the control knobs offer, they might seem intimidating at first, but they’re not at all hard to master with a moderate time investment in discovering what this magic box can output. The Sea Machine V2 offers state-of-the-art sound quality and modification choices rarely found elsewhere. Ranging from lightweight chilly chorus to a wilder metal-like tone, it can fit in various pedal setups on your board, and it will adapt to your needs, thus follow your guitar every step of the way. The Sea Machine is one of those pedals that offer much more than what its price suggests, if you in need of some sweet chorus with extensive customization, this pedal should be your first choice. With chorus pedals, moderation is absolutely the key. While this applies to most effects pedals out there, it is even more imperative in relation to chorus effects. It is very easy to push things overboard and destroy your organic tone without even realizing it. Before we get to specific settings, we have to spend a moment talking about the placement of this pedal in your signal chain. We discuss guitar effects pedal placement in depth here, but we will give you the relevant summary just in case. Due to its nature of copying, delaying and putting back together the input signal, chorus should be placed near the end of the signal chain. The main reason for this is the fact that you want all of your other effects applied before this deconstruction takes place. Otherwise, you can end up with a very messy tone that just won’t feel nor sound right. For the most part, your simpler chorus pedals will come with only two control knobs. One is going to be Rate and the other is Depth. They might not always be labeled as such, but those are the core controls of an average chorus pedals. Rate is what dictates the amount of delay in the effect. It is also the main culprit when something simply sounds off. This is why most users generally agree that rate should be used with caution. You want to start low and work your way up. Pushing it to the extremes right away can only lead to disappointment. The next control is Depth. This knob dictates how intense the chorus effect is going to be. Although it is a bit more forgiving than Rate, Depth should also be used with caution. Adding too much can completely negate any value chorus can bring as an effect. Then again, it all comes down to what kind of chorus you want. Overall, figuring out a chorus pedal, even the basic one, takes quite a bit of experimentation. Being such a subtle modulation effect, chorus isn’t really something that will benefit your tone in every single situation. You could say the same about flangers as well. Chorus is definitely not an effect you want to keep on at all times. Instead, there are several known uses where this effect adds the most value to the music you are playing. Using chorus with clean sections in your song can yield some pretty awesome results. Think of that Nirvana song we have mentioned earlier. You can dial in a good tone that adds girth to your guitar, which comes in handy especially if you are the only guitar available. Using chorus with a clean channel is also one instance where you can let yourself go with in terms of Rate and Depth. Just keep in mind that different chorus pedals sound differently when you start adding significant amounts of the effect to your source tone. Once you push that overdrive or distortion into the signal, things change a bit. Generally speaking, heavy distortion and chorus don’t necessarily go well together. However, a solo with a subtle amount of chorus applied is definitely the way to go. Aside from simply giving you more girth, using a chorus pedal in this scenario allows you to stand out in the mix with more authority. With that said, it is paramount to know when it’s time to stand out and when you need to melt into the mix. If you keep the chorus on at all times, the rest of the band will fall behind, which can definitely ruin an otherwise good mix. As it is the case with pretty much every effect out there, choruses can come in different flavors. Some are basic while some are complex. On the other hand some are transparent while some aren’t. In this section we will touch upon all of these factors in depth. Chorus transparency has a lot to do with how a pedal alters the core tone. Transparent pedals are naturally those that don’t change the core signal too much aside from adding that delay. On the other end of the spectrum, we have extremely warm choruses. These are great for clean sections where you need a bit of width in addition to the effect itself. Additionally, you could top this combo off with a decent clean boost pedal. The complexity of a chorus pedal isn’t necessarily an indicator of its performance. Some of the best models out there come with the two simple controls we have mentioned earlier. With that said, there are other features you might run into. One of the most obvious features is the two band EQ which allows you to shape up the low and high end. Then we have the stereo output in addition to the standard mono. With this feature, you will need two amplifiers in order to get the best effect. Anything more complex than this often moves us to the chorus processor territory. With processors, you can select a variety of different chorus modes, adjust various additional aspects of the tone and more. It is worth mentioning that advanced chorus processors are specialized tools meant for those who really need all the extra bells and whistles. As a beginner, one will get all the performance they need out of a more basic model. Lastly, lets talk a little about analog choruses and their digital counterparts.The situation here is about the same as it is with other types of guitar effects. Analog models are more expensive but they bring certain benefits. We are talking mostly in terms of lower noise levels, that analog warmth and several other things. Digital choruses are great because they come at a lower price and are packed full with various modes. Again, it all comes down to what you really need. Both the analog and digital choruses are tools of their own. This concludes our selection so far, offering various mixtures of options and ways of sound enhancement, however they all share one thing in common – which is immaculate quality in terms of the marvelous effect itself, meaning quality is assured no matter what your pick is here. We’ve made sure to offer the best of the best when you combine quality and affordability. So surprised that the Strymon Ola is not there!